The early bird registration extended till October 15th !!! Due to the size of the venue, the space is limited. We strongly encourage the earlier registration. 3) Print the waiver form to sign (Please see the bottom of this page titled "Wavier" ) and please bring it to the seminar. Lodging is available at the Point Reyes Hostel in Men’s and women’s bunk rooms. $70 for both nights. Space is limited. If you are interested, please register by September 14th and also indicate M or F.
Please print out, Pt.ReyesAikido2018Waiver, and read the attached form of Personal responsibility statement and waiver below and sign. If you use PayPal payment, please bring the signed form with you to the seminar. You can also mail it with your check. NOTE: You are not allowed to be on the mat till we have your signed waiver form. 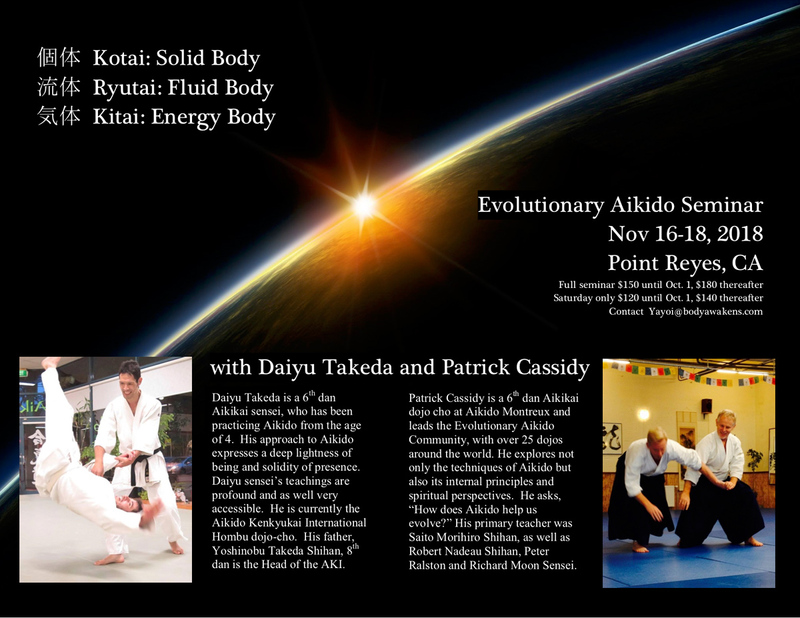 If you have any questions, please email Yayoi@bodyawakens.com.